I've been on a bit of a spree lately here on t.org, with more posts in May than in any other month but last October, and as many posts as any two months since then. I've had a few things worth saying and sharing. It will be a busy couple of months. It will happen (even the new job, I tell myself), but it is going to take ... fewer words, more action. There were a few other challenges he overcame. For one, it's possible to get negative values for map position... shame on me for not flinging notes to the far reaches of the map view to find that. While it's okay to have negative positioning values in CSS, you don't get to see them-- Mark's code shifts all the values to positive so that notes don't start off the web page. Also, my guesstimation of "3 em" per TB map unit is just that-- an estimate. I'm so glad he took this on, and that Mark Bernstein apparently chipped in a few suggestions ... as the next t.org post shows, there's no way I could do this coding now. 1. You need to set the Map <div> to sit 'absolutely' below the title. I've hard wired this in both the TB (user attributes) and the templates (fixed values) but the latter could be automated. 2. You must have declared the <style> and <div> tags *before* the JS addresses them . This explains the order of some of the tags. 3. CSS 'outset' for buttons doesn't use TB or CSS colours - though you can supply the latter if you could figure how to work shades of the 'chip' colour (too much fiddling IMO). The result is flat colour button 'sides' - not the nice TB emboss shapes. 4. CSS buttons are added outwards (button gets bigger). In TB, the border is applied inwards. 5. The strange check for colour #6f0000 is a trap for TB's undefined colour value. Why #6f0000 I've no idea. One of the challenges I saw in my initial experiment was to make the solution drag-and-drop, plug-and-play, or what have you. I wanted someone to be able to take it and use it with their existing file and then forget about it. Mark's solution almost (but not quite) does that. MapMyChildrenJS uses a couple of User Attributes that don't come in a new Tinderbox file, and that means that you have to add them. It's near enough that you can define them once, give them some defaults, and be ready to go, but if your file doesn't have those attributes, the result will be functional but not pretty. In my case the result was too big, and some text wrapped strangely. Not a fatal flaw by any means. The new attribute is: MapNameFontSize , a number attribute spelled and capitalized exactly so, and with a default of "12". Without this the resulting map seems to be large. Look at Mark's test file to see some other attributes. Most of them seem to be for testing, but there are a couple more that deserve a look, like TitleFontSize. There's still no way to get link lines going, which is sad since finding patterns in link lines is a major source of serendipity when using Tinderbox. Since adornments aren't exported at all, there's also no way to display them. Even with those limitations, these templates could work well for the occasional export of a cool map view or for Tinderbox hypertexts which rely on the basic diagramming that the Map View allows. The other night on my bus ride home a stray thought about CSSimplicity touched off an idea for exporting the Tinderbox Map View onto the web. I've wanted this for a good while, but the only method I could think of for getting a working map view to the web was a screen shot doctored in the HTML to be an imagemap... not exactly a scalable solution. I got the following as rough equivalencies. The ones in italics didn't fully work in my experiment. In other words, don't hold your breath until it's done. I'm going back to CSSimplicity later this week. There are some other things that this could use: CSS properties to make the text wrap at a fixed note width and not to extend the div if the text is too long for a fixed height. Borders, which Tinderbox handles in a tricky way. But, for now? I'm elated that I got this much to work in about 45 minutes. It's a testament to the transparency of Tinderbox. surftrail is Anders Fagerjord's personal blog, and it made a bit of a splash among weblogs in August of 2003 when Anders made each blog entry its own webpage rather than taking the standard approach of collecting many entries onto a single web page. Most blogs allow the reader to read an entry only in the context (a page) of other entries, whether the context is a chronological archive, a category or subject grouping, or a search result. if you buy into the "golden age of hypertext" rhetoric, you get to write 'more like the hypertext novelists'. and if you don't buy into the nostalgia, you still get to take advantage of the features which made the novelists choose the medium in the first place. This is different enough that folks have started to call such blogs Fagerjordian. I didn't do it quite the way that Anders did. I considered it, but it's a bit limiting. Besides being a blog, t.org is intended to become a directory of readings of 'nouns' in the field of hypertext-- articles, hypertexts, people, events, etc. I don't want to limit myself to having post = noun; I want a post to potentially contain 'nouns' (some already do), or to not be a noun at all. Blogs and social networks and wikis, oh my! An article in CNet looks at how corporations are beginning to adopt easy web-publishing tools in their businesses... and how they're not. The article almost avoids clueless sensationalism. Why now with blogs and wikis? I wonder why these collaboration tools are taking off where Lotus products didn't over the last 20 years-- or only did so in select environments. Perhaps we've reached the knee of the pervasive-computing curve, and enough people 'get it' to start working by 'hub and spoke' rather than 'point-to-point' models. Or perhaps enough people 'get it' that they've learned how to transfer their business models and social networks into digital tools... after all, we've had project managers and the like doing wiki-like synthesis and management for a long time. The points about blogs are interesting on another front. With thorough blogging and thorough syndication, the experience of the web becomes more thoroughly decentralized. People produce and publish information-- it's good to have so many people writing because it makes them reflect, synthesize, and articulate themselves. The tools then aid the flow of that information by adding metadata, searching for relevant relationships, aggregating feeds, and presenting it to others. It's barely even a hub-and-spoke model because the ends of the spokes only see the hub if they're wandering. Tim Bray recently told Mac users to stop using their web browsers to read the web and pick up NetNewsWire instead. A feed aggregator certainly adds a lot to the experience (and NetNewsWire has relegated my Safari auto-tabs to the dustbin), and my fears that I would stop finding new feeds haven't come true, so I guess it's a good thing. I think that they're still tools to be used in concert, though. A sidenote-- I'm feeling a split between this sort of entry and what I intended t.org for, but I can't articulate it quite yet. I started t.org intending to make post objects that discussed 'hypertext' in some abstract way, perhaps 'hypertext theory' though I haven't called it that so far. This is hypertext in the trenches, social hypertext theory. This isn't a problem, but it's an interesting trend. I'm going to map it out the Tinderbox Map View to see if a casual scatterplot reveals a Venn diagram of my post types. I've been writing about wikis and related topics, so it's time for a collective entry. I've got a wiki definition in the glossary (the first topic herein), but there's more to be said. This is the wiki tool entry, an entry in the t.org directory for wikis en masse as a tool. It will probably collect more subtopics as I write more about wikis later. For now, it's worth relating an email discussion with Ken Tompkins about wikis in the classroom. Ken Tompkins wrote me after the DokuWiki entry and had some thoughts about wikis in the classroom. After reading his email I had to check to see whether I'd made the post about ideas for wikis in the classroom or not. He was two steps ahead of me. I have tried a number of types in a few classes and have come to the conclusion that they do not serve college educational purposes well at least in the literature classroom. I have been playing with wikis and blogs for years; indeed, I run a Manila server at Stockton and each Literature major is required to have a blog. We have over 1500 at present. The best wikis, in my judgment, are those that offer relatively stable facts; the TB wiki is a good example as is, of course, Wikipedia. These serve real needs, change when the facts change and reflect present knowledge states. If this is true, then move the functionality to the classroom. I work really hard NOT to repeat much of the material in my classes. This means that exam questions, paper topics, lecture materials, class handouts are all fairly dynamic. If I were to move such materials to a wiki, it seems to me that I would be putting changeable concepts into a stable environment. For me, at least, and you will probably disagree, this is counter-productive. This makes sense to me except for the assumption that wikis are strongest with static content. I began to argue (to myself) that the strength of wikis is that they are dynamic. The most static wikis are like coral, with a strong static center covered in a skin of vibrant (and changing) life. Like a teacher actively listening to a class discussion, wikis can help make apparent the emergent structure of the community's knowledge. George Landow's work with Intermedia functioned a lot like a course wiki might work-- a core written by the instructor which is then linked to and from by students hanging their own work on it. An instructionist (information-transmission) style of teaching assumes a stable canon for students to absorb. The web is most useful to instructionist teaching as a reference, a rich hypertextual presentation of the canon. In that context, a wiki is merely another tool for constructing a reference website. ... It seems to me that what appeals to educators about wikis is the PROCESS. Here is an environment where constructivist thinking can shine. From this standpoint, I should have created a wiki context and then assigned students to create the medieval content that I had created for them. Fair enough except college students are notoriously uneven in contribution to such endeavors. I actually did teach an advanced Shakespeare class two terms ago and created elaborate and clear responsibilities for posting article reviews on the plays that we were reading. The best students did the work without hesitation; the weak students (these outnumber the best by 5:1) did little, did poor work when they did it, did not understand the concept of the project or of wikis. What resulted was a very uneven set of postings and, therefore, a very limited class resource. I think I can hear you saying: Well, the responsibility for guiding the students was yours and if you are not willing to watch them, prod them, coax them, threaten them on a regular basis, then you shouldn't have made the assignment! Exactly. a place where the spammers cannot enter (this latter is critical on the TB wiki and is the reason I have locked my wiki up). I also think that they work best when the content is fairly stable. clear guidelines for expected participation levels, styles, and locations ... though take care not to proscribe the creativity. I also note that DokuWiki, from my experience, does well at addressing the ease-of-use, clarity, and protection concerns Ken raises. He also noted in his email that he's enjoyed Moinx and Tiddlywiki. I haven't tried them, though a quick glance at Tiddlywiki excited me about the possibilities for creating a linear projection of a hypertext reading experience. I replied to Ken's email with a fraction of what I had to say because of timing. Thinking more about the wikis I know, there is a tough balance to strike between dynamic and static content. It's easy for the dynamic 'noise' of a wiki to start obscuring what could be the stable reference material. Further, in the classroom, the overhead required to have students build equally, productively, and in a manner you can usefully assess might be more than wikis are worth as a tool. George Landow found some ways around that problem a while back, or missed them entirely somehow, and I'll have to finish reading Hypertext 2.0 to see how. The pedagogical problem with desktop programs -- Radio, Moinx, Tiddlywiki -- is that students don't always have reliable access to a computer, can't always install something, don't have a mac, etc. so one is forced to use more centralized servers. It's a shame because some of the desktop functions are powerful. I haven't played with desktop-based wikis, and am curious to see and hear about the advantages. This emerging era is characterized by the collaborative innovation of many people working in gifted communitites, just as innovation in the industrial era was characterized by individual genius. We are still in a model that awards individual genius more than collaborative innovation... yet in an exceedingly more 'open source' world, contribution is the expectation. In agreement, I'll say that wikis can be an excellent tool for breaking out of that educational model. Wikis require collaboration and make explicit the student's engagement with the published 'canon'. Blogs teach that lesson on the large scale as the student's outbound links (and inbound replies) form a broader discursive hypertext; wikis teach the lesson on the local level as students edit what becomes a consensual text, refactoring their own work, and developing their own local canon. DokuWiki has a very thorough Wiki Engine Comparison. Wow! ... and some tips for setting up a documentation wiki that might be useful toward other purposes as well. "Matt Barton explains what the heck a wiki is, and why compositionists ought to use them in their classrooms"
The latter is great! He lays out a continuum of applications stretching from 'antithetical' to 'philosophically compatible with the wiki way'. Rather than say the 'wiki way' is for some reason better or best in the manner of a hammer seeking a nail, he notes that applications that work with the 'wiki way' are going to be aided rather than hindered by the medium. He's clearly thought through the philosophy and how it plays out in a wiki and applied that to some likely classroom applications. Yes: reference guide. Bibliography. Editing of a document. Textbook. No: personal site/portfolio. Argumentative essay. Novel. TSOR on his site doesn't turn up clear links to wikis by his classes, but he does have some forums which are worth a real look. About Tikiwiki itself... I don't like the cluttered interface on his site, but it does look to be full-featured as a wiki-centered community tool. It's got a wiki for educators, though that seems to be largely moribund. It's worth a look sometime. The well-linked My Brilliant Failure: Wikis in Classrooms on Kairosnews. Thanks to Mark for the nifty quotation style which I installed tonight. He set up a smart style on his own site which I've transferred to t.org. Last week I wrote the first in a series of entries about adapting the Tinderbox Simplicity template to CSS. The first step was to analyze the existing template to glean its structure, and I marked up the stylesheet and the html of a sample page to do so. This next step, then, is to move it over to CSS. I'm going to take it slowly and with lots of explanation, because figuring out exactly where CSS ends and HTML begins was tricky for me. Two disclaimers: First, I'll walk things through, but I'm assuming that you have a very, very basic level of CSS. I'm assuming knowledge of CSS Syntax. If you're not sure, scan that link-- that one page is what I'm assuming you know. Secondly, I'm being "thorough", by which I mean that the end result will be a bit more complex than the Simplicity template. 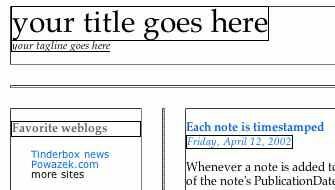 The HTML will be simpler (without the tables), and the templates will be simple and easier to edit, but the stylesheet is going to be rather longer than the old one so that more of the page is stylable. That extra complexity will hit in this post, so if it seems confusing, shake it off and go to the next post. I'm being thorough for two reasons: First, I want to be able to do CSSZenGarden-like styling, and that means having the CSS mirror the semantic structure of the Tinderbox notes. Secondly, being this thorough means that the CSS can mirror the semantic structure, and that in turn means that your visual style can more clearly indicate the semantics. I.E. You can make your blog easier to read and navigate. The whole thing is turning out to be a bit more of a process than I thought, so it might take two steps. Here goes. Looking at the marked-up sample page from the last step, there are several things going on. The table breaks the page into four main parts: a header, a sidebar, a body, and (outside the table) a footer. Inside of those sections, we know by the structure of the Tinderbox file that we have several 'sidebar' notes (About this site and blogroll) and several 'body' notes (Each note is timestamped and Design by Derek Powazek) and several 'footer' notes (Navigation, Copyright). 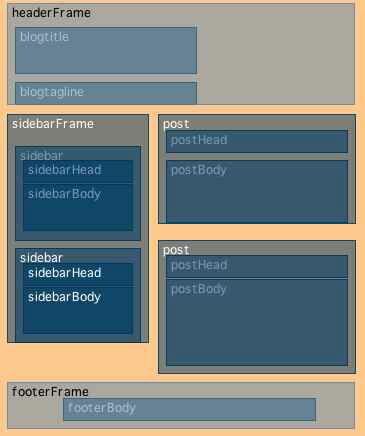 and a template that produces the footer. We don't need any other templates yet because the other stuff --title, 'made with tinderbox' logo, dividing lines on the page-- don't correspond to Tinderbox notes. They're just HTML. Here's a quick picture made in the Map View out of adornments which shows the structure of the page and its html templates. I'm not sure why the names are of different brightnesses. And, in fact, we have those templates. We just need to adapt them to use CSS. 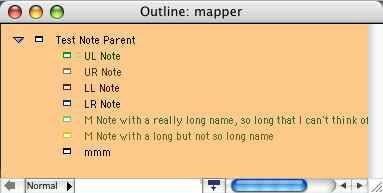 If you want your entries to have child notes, you'll need a template to make them appear on the pages. If you want your entries to be pages unto themselves so that you can do "crazy things" like link between them (I've heard the term "Fagerjordian" applied for Anders Fagerjord's Surftrail) then you'll need a template that is ready to put a post on a page rather than a bunch of posts. If you want to combine these ...say, *blush* have entries appear one way on the front page of the site and a different way on their own unique post-pages, plus have child notes in both cases... well, I'll get to that. Someday. CSS is very flexible. Styles can be any combination of attributes you might change about text. Styles can "cascade", meaning that if you tell a paragraph to be green, and then have a style that's bold but doesn't have a color applied, the 'green' cascades down into the bold section so that it's green and bold. When you take a bunch of styles and group them to apply to text, that's a class, a class of text. So we need to figure out what classes we need in our stylesheet. We need classes(s) for all the situations where we want to affect the appearance of the text. If we want the ability to have our posts outlined or in a color or spaced a certain way, then we'll need a style for them. If we want the sidebar to appear in a certain place on the page (or have the flexibility to appear on the left or the right without changing our HTML templates) then we'll need a class for the sidebar. If titles are bold, we'll need a class for them. If links are colored and get an underline when you put the mouse over them, as is the case in Simplicity, then we'll need a class for links. Note that I'm being (overly?) thorough with that list. The original Simplicity gets away with styles for just: text, heading, tagline, date, sidebar-head, sidebar-list, link. To replace the tables in Simplicity, we'll want two different kinds of classes: classes which determine the appearance of text wherever it is on the page, and classes which determine where on the page the sections are (basically, which replace the table cells). We can't conflate the two because then we'd have all of our ... oh, blog entry titles appearing in the same place on the page, or we'd have our sidebars all over the place (but pretty!). 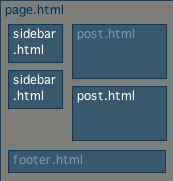 Notice how this mirrors the structure of the html export templates on the page. This means that the html export templates are going to be pretty simple (in the next CSSimplicity post). So all those styles which place things on the page are going to go in our stylesheet as IDs. Then we can put in the classes that will get applied one to each note. There will be many of these, so they're a regular class. On the other hand, we supposedly don't know what sort of html thing these might be applied to, so we'll include them as classes independent of the html element. It's almost always going to be a <div>, but we need to be open-minded so we'll leave out the selector. Now that we know what the styles should be, we can plug in the old styles. Add some comment headings for readability and we have a stylesheet framework. Next up: Ridiculously simple template making. I realized that the diagrams I've made of the html page re: exports and re: classes might help, so I've added them and moved the text around a bit. I've gotten in on the badge-sharing that has been going around. There's now a "BBEdited" button in the sidebar, made from Vlad Spears' photoshop files. and you're welcome to it. If you want to make a suite of your own "80x15" badges, there are some nifty tools out there for doing it: one that seems to have started the trend (and generated some controversy) and one that lets you put in small images. I didn't use either because I liked the 'pop-out' graphics of the 2Second(Fuse) badges, but it's a place to start. Vlad Spears posted the photoshop files for the 'badges' on his site. I adopted several and made one to pass the love to BBEdit. I've done all my HTML editing (and a fair bit besides HTML) in BBEdit since 1997. Feel free to grab and/or cannibalize my badge for your own site. I've just installed DokuWiki at work, and I have to say that I am nothing but thrilled with my first real wiki-founding. Warning: the rest of this entry is almost entirely positive... fanboy-ness ahead, even if it is followed by actual discussion of wiki social issues. Wikis are excellent for having a group of people who may not be in the same place, may not have knowledge of HTML, may not know the structure of the overall text, and may have better things to do than worry about those things (like writing) focus on the writing. The fact that wikis (and, to be fair, their predecessors) are now making the terms 'read/write web' or 'two-way web' usable shows that there is a ease-of-use cusp, that wikis have pushed us past. It's so much easier that it's something different. First of all, it's called "dokuwiki". Dah-kyoo-wih-key. It's fun to say. It automates hierarchy within a page, building an index of your headings at the top of the page if you have more than three. it's open source PHP on Apache-- common tools. Installation was even easy... after a fashion. To install it on OS 10.3 I needed to have Darwinports. Darwinports required XCode, which wasn't on the machine I wanted to use. I installed XCode but couldn't get Darwinports to install after about two hours of trying. No love came from the Darwinports list, so I gave up and tried an Aqua app. That kept everything in a database, though, and was ugly and low on features to boot. Then... I installed DokuWiki on my company's hosted webserver and ... a half hour later it was running with ACL security active and HTML enabled. Wow! Now my wiki-for-work is my first wiki, and is less than a month old, so I'm shooting from the hip, here. That said: I think that a wiki intended as a source of information, even one which is a collaboration between true peers, needs an organizational vision. An authoritative author or authors, or more delicately, an Editor. A wiki intended as a forum is a different thing, and might be more free-form to allow for emergent structure. This seems to be a philosophical schism in wiki authorship; the strength of a wiki is in the ability of every member of the community to contribute, be it with questions, answers, theories, evidence, or signs of cluelessness. All of these are helpful because the wiki can then accurately represent the structure of thought in the community. But it can also then get pulled into the confusion or the discord in the community. If the goal of the wiki is to represent the 'state of the art' for a community, the emergent structure is important to see even when the structure is 'conflict'. But when the goal of the wiki is documentation, to help bootstrap most of the readership to greater knowledge, then that discord will more likely lead to frustration and abandonment before it will lead to epiphanies about the challenges the community faces. It seems that a greater authority, even in the form of an active moderator (rather than author) may help by setting down the spirit of the community, by providing a vision that the 'cats' are more than happy to be herded by. Regarding wikis aimed at documentation or user support, I side with the authoritarians with the caveat that a good wiki will have areas where open discussion, questioning, and tinkering is clearly welcome. 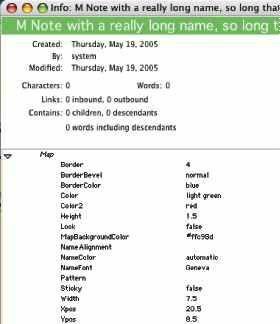 For instance, the Tinderbox Wiki evidences (as of this writing) that people don't know where to find or place things. Has their comment been replied to? Is the question already answered over in the [FAQ]? Or is that the [Frequently Asked Questions]? These are dummy examples, but the point is: without a clear framework for us to build upon, all the good will in the world is going to be hidden within a tangle of different conceptions of how documentation should work. And this is done with the best of will. What we could have is a body of documentation which is criss-crossed by trails established by as many indices as we have perspectives on the material. Once the material is there... want an index (linking edit-discouraged pages) for YourFirstDayWithTinderbox complete with narrative context? Sure. How about ProducingPHPFromTemplates? Sure. But without a clear sense of what is an answer area and what is a question area, where discussion should happen and where plain description is, those indices are likely to start bearing content... which someone else won't know is in ProducingPHPfromTemplates and not HowToMakeTemplates or ExportTemplates. We're already running into this issue in our work-wiki because we're refactoring an old html-based documentation site into the wiki. We have it easier than Tinderbox (or Wikipedia, etc.) for a few reasons, though. Ours is a documentation wiki, and the work we're documenting has a clear structure-- several constituencies with discrete functions and tasks. Several namespaces are clear and useful: summerNetworks and summerSetup vs. yearNetworks and yearSetup. There are grey areas when something applies to several constituencies, but those are by far the exception, and when they pop up I as head of the department can determine policy. We'll have discussion, but most of it will happen offline, so the wiki doesn't need to deal with it. The answer, as usual, probably doesn't lie in either the extreme of control (restricted edit privileges to the site or hard-line 'fixing' of edits) or of freedom (unmoderation). From my lack of experience as a wiki moderator I wonder whether there isn't a happy medium in clearly defining portions of sites or pages where edits and discussions are encouraged and portions where edits by anyone but the 'editors' are allowed but socially discouraged. The software I've played with attempts to solve this with software. One package made the easiest way to edit be a 'comment', which was just a wiki editing window that deposited the typed text onto the bottom of the page in a write-only fashion; edits to existing text were still possible but required clicking through the editing process. Dokuwiki doesn't do that, but the top of the edit page asks: "Please edit the page only if you can improve it." I like that sort of social solution. There are many, many interesting pages out there about wikis. For history, there's the original WikiWikiWeb, started in 1995. There's Wikipedia, (can it be called the currently most popular or successful wiki?) and their entry on wikis. MeatballWiki is a meta-wiki for "a community of active practicioners striving to teach each other how to organize people using online tools." It has neat discussion of social challenges like ForestFires, BarnRaising, and DocumentMode vs. ThreadMode. Weblogg-ed discusses "The Read/Write Web in the Classroom", often including wikis. I'm really interested in wikis in the classroom... including the failures. Someone wrote a nice quick review of DokuWiki which I agree with and hosts a Word file-conversion tool. Can't figure out who, though, because their site doesn't say anywhere. 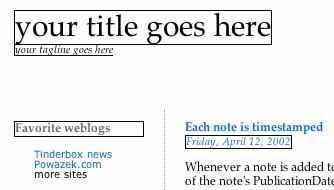 I've come up with a title for this post that makes it sound like a musical, but the fact remains: I've put up a simplistic rss feed for textuality.org. I'm still playing with it --trying to include html and links rather than just plain text broke it for LiveJournal and NetNewsWire-- but it is up and working. Thanks to Doug Miller for suggesting the feed and for advice. As this edit indicates, I've changed my RSS feed so that it does full text on the entries and doesn't break. I'd been holding off on full-text because I couldn't get html to work, would have to add children and build a template for them, etc. Alwin pleaded to the world at large, Doug Miller sent advice, and now it's working. It still doesn't validate, so I've got some work to do. Once it does, I'll post some advice. The (several-year-old) Simplicity export templates have a few problems out-of-the-box and it can take a while to figure out the fixes if you're new to syndication. In the meantime, here are some sites that explain how to set up your own RSS feed. Tinderbox (and the Simplicity template) does a lot of the work for you, but if you're having trouble, these might help you diagnose the problem. devX.com: Set Up a Simple Syndication Feed Using RSS - A bit complex because it's aimed at database developers, but they do really get into the guts of a feed. [2005-05-03] It basically just aggregates results from available searches on Google, Yahoo, MSN, and a few sites you have to be registered on. Ah well. One of the wonderful things about personal weblogs is how they cross categories. I may for this site start reading a blog because it mentions hypertext on a regular basis, but then I get to read about good food, or electronic music, or real estate... and maybe how they relate to hypertext. And if I'm really lucky, the blogger has properly categorized their entries into a nifty index. I don't want to add all of these blogs to textuality.org because this site has a sharp focus which I want to maintain; nevertheless, I think t.org needs a collection of the relevant categorical focii from them. So in this entry, the subtopics should end up in the Categories list rather than this entry itself, and each is the 'hypertext index' from a spiffy blog. And yes, for the record, I hate the term 'blogosphere'. I want a term for 'the set of weblogs' that doesn't sound like a 1st Edition D&D monster. Steve Ersinghaus' Great Lettuce Head touches (as advertised) on: fiction, English Literature, New Media, Writing, and technology in education. And it has a hypertext category. Doug Miller doesn't have a hypertext category in his blog per se, but his Tinderbox, blogging, and education categories are all relevant to t.org's interests. Dylan Kinnet's NoCategories' largest or second largest ... category ... is on hypertext. Kottke.org doesn't have a category on hypertext exactly, but does have a section on web technology, and that seems to be where the hypertext issues that I'm interested in fall. I need to write about "hypertext" vs. "the web" since that's such an FAQ whenever I mention the term. Michael Angeles confusingly lists URLGREYHOT's categories as separate blogs. Regardless, the content is interesting and the topics closest to the heart of t.org are the information work blog, Education, and the Education blog. Even if he is into homeschooling. It looks like "Education" is separate from the "Education Blog" in that, like t.org, the site contains things which are outside the blog and exist in a broader hypertext.